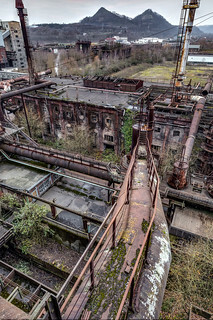 The Völklingen Ironworks (German: Völklinger Hütte) is located in the German town of Völklingen, Saarland. In 1994, it was declared by UNESCO as a World Heritage site. It is an anchor point of the European Route of Industrial Heritage (ERIH).